This shirt from Thomas Dean is highlighted by a cool paisley pattern and a 100% cotton construction. Embroidered orange "TD" initials at front bottom of shirt. Shirttail hem. 2 button cuffs. Classic fit. 100% Authentic Thomas Dean. Blue and White Plaid - Size M. Machine Wash - Tumble Dry. 100% Pima Cotton. Blue / Green / Black Volkswagen Beetle / Bug Cars on White Background, Contrast Tonal Blue & Black on White Diagonal Plaid Fabric at Inner Collar & Cuffs. Thomas Dean. Button-Front Shirt. 24.5” (end of sleeve to shoulder seam). 100% Pima Cotton. Thomas Dean. 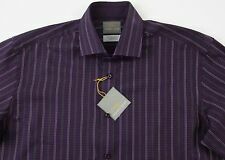 Purple with Silver-Gray / Charcoal Gray / Black with Black & Purple Diagonal Weave Micro-Plaid Accents (Inner Collar / Placket / Cuffs). Button-Front Shirt. 19”( shoulder seam to shoulder seam). 100% Pima Cotton. 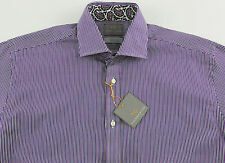 Tonal Purple / White Stripe with Purple / Pink / White / Olive / Black Paisley Contrast Fabric at Inner Collar & Cuffs. Thomas Dean. Button-Front Shirt. 25” (end of sleeve to shoulder seam). Thomas Dean long sleeve shirt. All are wearable and in good condition. If there is anything out of the normal. Pictures of and make them look like they do in real life. Great condition. Pattern: Plaid. Contrast fabric inside neck and cuffs. Color: Grey, Brown & White. Style: Long sleeve button up sport shirt. Brand: Thomas Dean & Co. DEEP BROWN. ZOOM IN AT ALL MY PHOTOS FOR A BETTER VIEW. STANDARD CUFFS. 100% Authentic Thomas Dean. Special Features: Flip Cuff. Care Instructions: Machine Wash - Tumble Dry. Color: Blue With Brown Stripes. Fabric Content: 100% Cotton. This shirt from Thomas Dean is highlighted by a cool plaid pattern and a 100% cotton construction. Shirttail hem. 2 button cuffs. Classic fit. Orange, black, grey and white plaid. Tiny orange and white diagonal stripe inside cuffs, collar and under collar. This shirt from Thomas Dean is highlighted by a plaid pattern and a 100% cotton construction. Shirttail hem. 2 button cuffs. Classic fit. Royal blue, white and light blue plaid pattern. Shoulder to shoulder: 19.5". Thomas Dean TD GENUINE Casual Shirts! Brand New! Very stylish! Good Quality! Chest Length (Armpit to Armpit). Vertical Length (Bottom to the top). This shirt from Thomas Dean is highlighted by a cool checked pattern and a 100% cotton construction. Shirttail hem. 2 button cuffs. Classic fit. Black, brown and white checked. Shoulder to shoulder: 19.75". Inventory # C00036. Thomas Dean Long Staple 2Ply Yarn. Green w/Black Stripes – See Photos. Long Sleeve, Button Front, 2 Button Sleeve, 2 Button Cut Away Collar Dress Shirt. The item isExcellent Used Condition ! This shirt from Thomas Dean is highlighted by a botanical pattern and a 100% cotton construction. Embroidered orange "TD" initials at front bottom of shirt. Shirttail hem. 2 button cuffs. Classic fit. This shirt from Thomas Dean is highlighted by a plaid pattern and a 100% cotton construction. Embroidered orange "TD" initials at front bottom of shirt. Shirttail hem. 2 button cuffs. Classic fit. Thomas Dean. Sleeve (Collar To Cuff) 33". Length 32.5". Chest ( pit to pit ) 24". This shirt from Thomas Dean is highlighted by a cool checked pattern and a 100% cotton construction. Shirttail hem. 2 button cuffs. Classic fit. Blue, grey and black diagonal plaid inside cuffs and collar. Width (underarm to underarm) 23". · Length (collar seam to hem) 32". 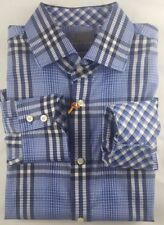 Thomas Dean Shirt M Blue Plaid 100% Cotton NWOT YGI Z125 New without tags, free shipping Photos tell the story best ... See detailed measurements of the item in photos using a tape measure -- check them carefully as sizes vary! Check out our amazing inventory of other items by including the three letters YGI in your search. For example, type in your search "pants 36x30 YGI " to see all of our 36x30 pants in inventory. STOP! Before leaving anything other than positive feedback, please contact us to work out an amicable solution. At YGI, we honor our return policy 100 percent. So, if you are unsatisfied for any reason, simply return the item for a full refund. Our feedback speaks for itself and we want to earn your repeat business. This shirt from Thomas Dean is highlighted by a cool plaid pattern and a 100% cotton construction. Embroidered orange "TD" initials at front bottom of shirt. Shirttail hem. 2 button cuffs. Classic fit. O Fit: Roomy o Machine wash o Imported o 100% Cotton Jersey. Length from top of shoulder to hem: 27.25". 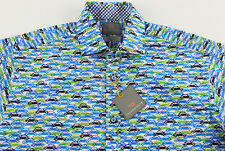 This shirt from Thomas Dean is highlighted by a cool geo pattern and a 100% cotton construction. Shirttail hem. 2 button cuffs. Classic fit. Red, charcoal and white geo print. Shoulder to shoulder: 18.5". Color - Purple. Fabric - 100% Cotton. Length (Top of Shoulder to Bottom) - 30.5". Chest (Armpit to Armpit) -22.5". Short Sleeve is Shoulder to end of Sleeve . Shoulder to shoulder = 17.5”. Note that there may be color shade and hue variances due to different monitors and device settings. Shoulder to hem = 29.25”. Shoulder to cuff = 27.5”. Sales are final. Thomas Dean Button-Front Shirt. • Pattern : Striped. • Collar: Spread. • Sleeve: 22.75" (shoulder seam to end of cuff). • Cuff Style: Standard. • Sleeve Length: Long Sleeve. • Color: White & Blue. • Length: 31" (bottom of collar to back hem).